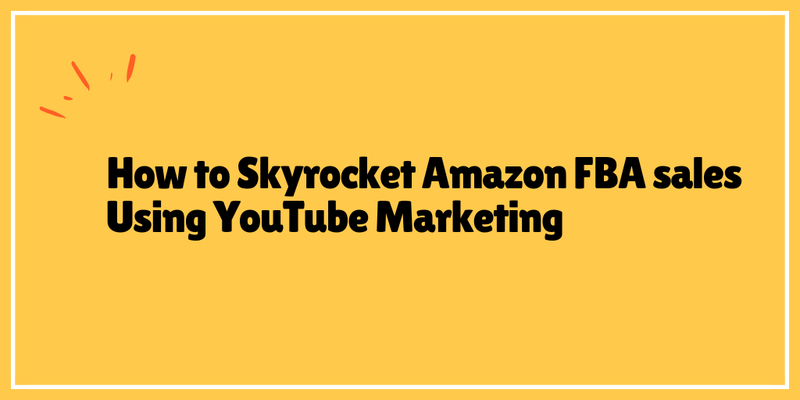 If you are in the e-commerce industry, selling on Amazon FBA gives you the opportunity for exploiting your reach and, ultimately, your revenue. But if you are unfamiliar with what seasonal products on Amazon are, going seasonal on Amazon would turn out be a big mistake. Seasonal products are those products that are available only during a part of the year, especially during Q4 (4th quarter). These are the in demand products during the season and can be quite profitable. However, during the rest of the year, the buyers will show little to no interest in these products. 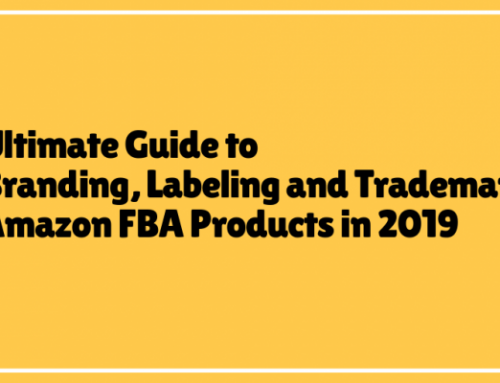 So, you are planning to sell seasonal items on Amazon FBA; this ultimate guide will answer all your questions to help you gain proper insight. It is never easy selling seasonal products; you need to find a winning product that will perform well throughout the season. You need a product that will perform well during the season. In most cases, the sellers choose products that are related to the four main seasons that occur year after year. These products are associated with spring activities. It is the time of rebirth, rejuvenation, and shedding the cold dreariness of winter. So, if you are thinking to sell during the springs, you need a product that your target audience will want to get it in the mood for warmer days. These products are associated with hot, sunny weather and summer activities. Summer is the time for people to go out on vacations, camping, beaches, and not worrying about school. Hence, you need a product that caters to people’s summer requirements allowing them to do fun activities while keeping them fresh during the hot times. 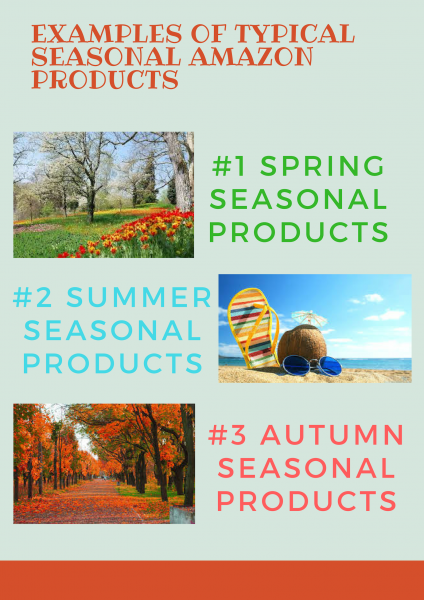 These products are associated with cool weather and autumn activities. Autumn is the beginning of the holiday season, new school year, and the football games. Hence, you need to choose a product that resembles the customers of the joys this season brings. Winters are typically associated with holidays, cold weather, and winter activities. It is the time of the year that experiences extreme cold, but also brings the joy of Christmas. Hence, you need to choose a product that either keeps people shielded from cold weather or makes an excellent holiday gift. There are part-time Amazon sellers who only sell during a particular season. However, it doesn’t say every product sold in a particular time has to do with summer, autumn, spring, or winter necessarily. Although there are some crossovers, there are particular products that are not season-friendly but cater to specific crowds at a specific time of the year. 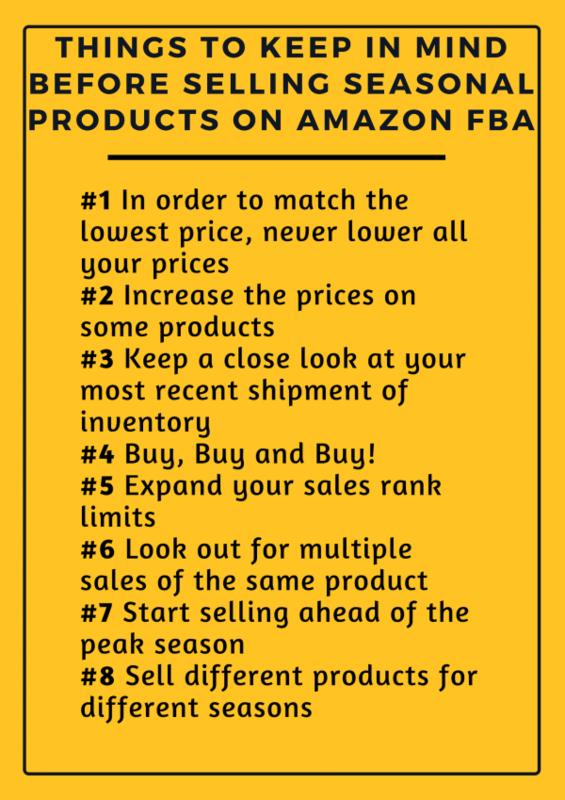 If you are just starting with selling seasonal products on Amazon FBA, we often tell the Amazon sellers that they should take advantage of seasonal bundles. Seasonal bundles are lucrative for those who are not confident enough for private label or who are struggling to get going on Amazon. Creating bundles and bringing a private label product to Amazon has some close similarities. For starters, you need to create a product listing, with photos, description, bullet list, and reviews among others and try to get ranked in the search. There are numerous types of holidays, seasons, and bundles throughout the year that you can take advantage of with seasonal bundles. Home run products sell very quickly while generating significant revenue. But not all products are home run products even if you think that they are going to be. In some cases, a private label product ends up being a ‘double’ or a ‘single,’ which means that it sells consistently, but not at a high velocity. We think that bringing seasonal private label products to Amazon marketplace could be a sustainable strategy. 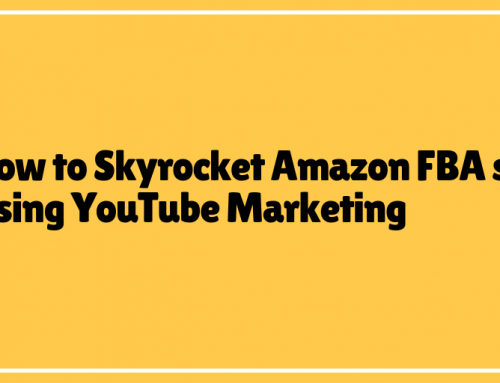 Plenty of Amazon sellers entirely focus on this business model and make massive profits. Although the products do sell all around the year, most sales come from 2-3 month period. You need to be on the safer side when you are selling seasonal products. You need to come up with an exit strategy in the events when your inventory is not completely sold out. Next, you need to prepare your seasonal products way ahead before the season even start. That is, you need to keep them ready to purchase the moment the sale begins. You need to prepare your listing with suitable keywords, high-quality photos, and good descriptions in order to make your product appear on the search list. You need to stock up before the demand for your products goes high. 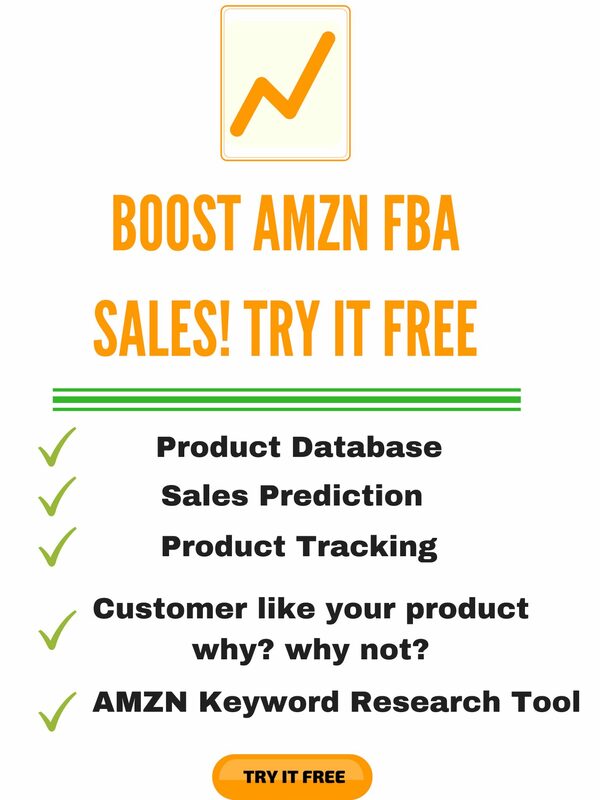 You need to deliver your inventory to Amazon fulfillment centers in advance. You need to ensure that you have accumulated enough customer reviews before the demand for your product peaks. More and positive customer reviews make sure that your product comes on the first page. You need to reprice your products from time to time in order to stay competitive. With the number of sales dramatically increasing during a specific season, it is a known fact that the lower priced products will sell out faster and your higher priced product will be there for the willing buyer. 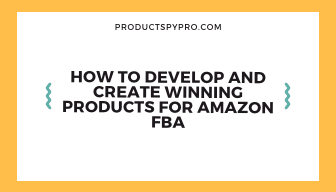 For example, during the fourth quarter every year, Amazon FBA ships over one billion products. The number speaks to the enormous opportunity selling through Fulfillment centers during the holiday season. Hence, this is the best time to wait and get your preferred price. 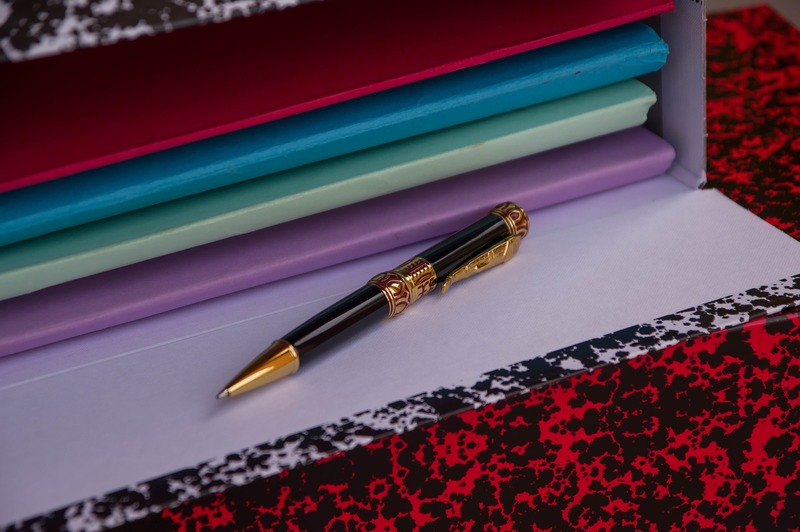 However, one exception, in this case, is if your inventory happens to have a higher sales rank and you have a lot of competition that is priced much lower than you. In such a situation, you can price as more moderate as the lowest priced competitor. This is fundamentally crucial if your competitors have a lot in stock. You can try raising the prices on some products with sustainable and really good sales ranks. 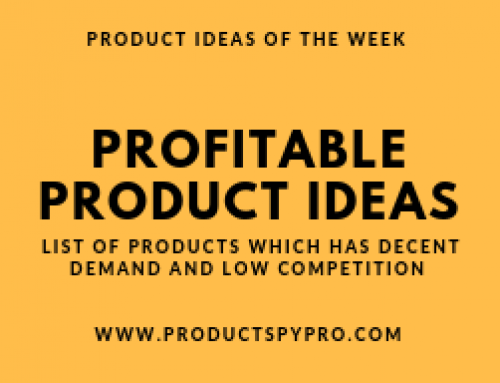 On the other hand, when you are first listing a product during a specific season or quarter, you may want to price some of your products much higher than usual, as the lower priced products of the competitors will sell out soon. 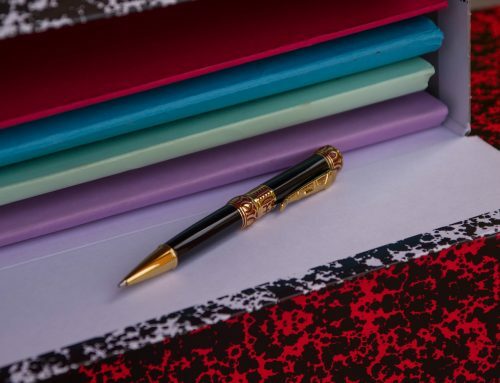 It is not a gamble that you have to take, but when you raise the prices of some of your inventory, many of those products have the tendency to sell out later during the day. But here is a catch! You need to select only those products that are sustainable and have good sales ranks. Let’s be honest; you are not the only seller selling the same product at a discounted rate during a particular season. There are hundreds of sellers like you trying to make the most out of season. 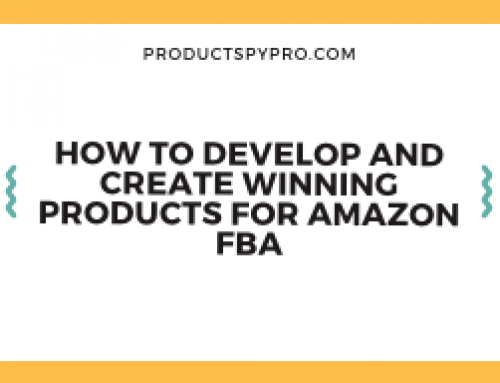 So, when you are looking at your pending sales, you should also look for new sales of products that you just sent into the FBA. 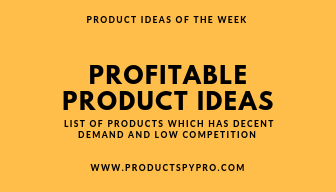 For starters, if your product sells the day it hits the warehouse, you might need to look at your price and ensure that you are priced competitively. This is because, many times during the seasonal sales, you might price your product on Monday when you ship it to Amazon fulfillment center; however, when your product gets checked in on Friday, there have been so many sales that the prices are now higher. If you are getting immediate sales, you need to check your prices. And if you are priced too low, increase your price. #4 Buy, Buy and Buy! 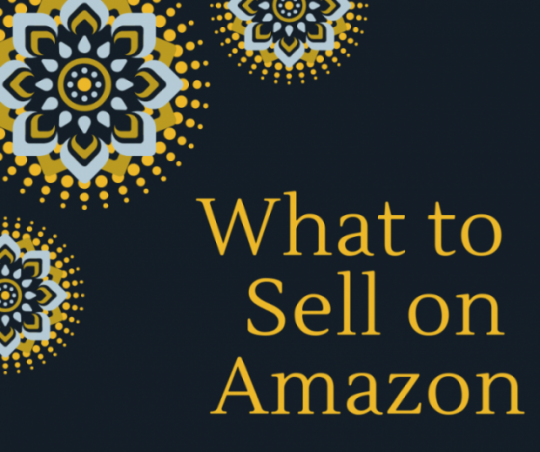 Unlike regular selling, seasonal selling on Amazon requires you to be on your toes. A specific season means people will buy this particular product during the season itself. This means that the demand for that product is higher during that specific season. So, you need to buy a lot more often than you usually do. The more you sell, the more you will earn. You have to make sure that your in-demand product never goes out of stock. So, you need to re-stock your inventory accordingly. 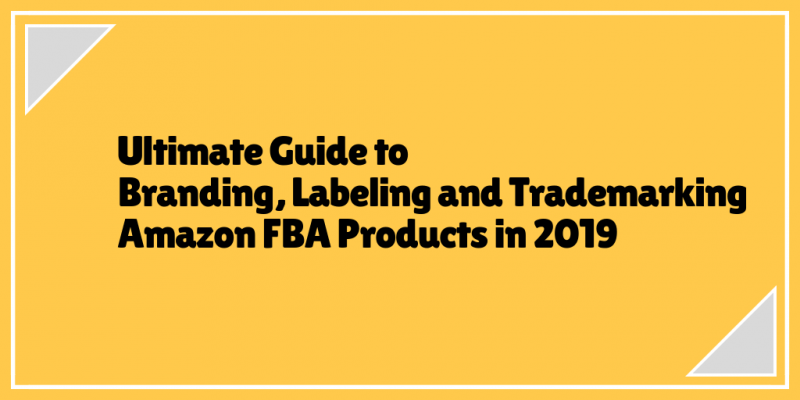 On the other hand, if you fear that your inventory will not go completely out of stock at the end of the season, you can try selling them on discounts, or you can withdraw your inventory from FBA and sell them next year. When you are buying products, you are always advised to look at the sales rank history. When the season comes, you should still buy products with a higher sales rank. Most products completely sell out on Amazon during the seasonal sales; therefore, the customers start looking for products that might not be as popular. However, each category is treated differently, so you need to process accordingly. Again, when you notice you have received many sales of the same item in your listing, you might want to check the prices on those products. Getting multiple sales is a good indication, but it also resembles that your product may be priced too low. So, it can end up compromising your maximum profit in sales, even when you sold the most products. Most of the successful seasonal sellers on Amazon have already mastered this. Starting to sell ahead of the season not only gives some amazing early-bird profits but also helps you generate a specific interest in the season itself. On the other hand, marketing your products ahead of the peak season may prove to be cost-effective for certain keyword PPC campaigns. Moreover, one of the most significant benefits of selling ahead of the peak season is that you get into the habit of ordering stock way ahead of time. Nobody told you to stick to one particular season. 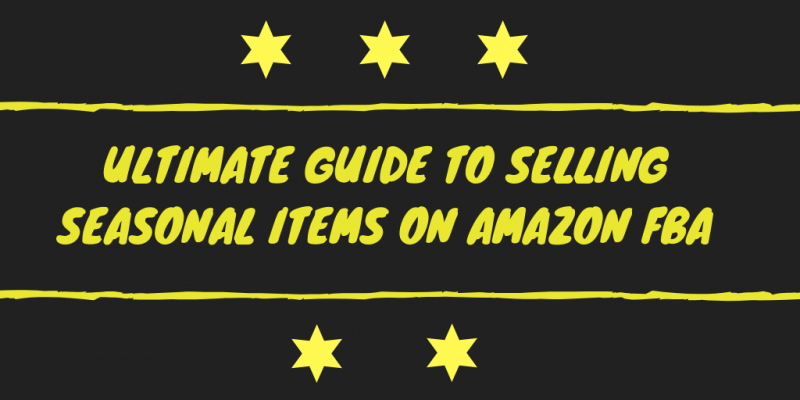 If you want to be a seasonal seller on Amazon, you should pick different products for different seasons. Selling different types of products according to the season is possible. It will not only make logistics easier but will also help your brand stay consistent with your inventory. Selling seasonal products on Amazon is difficult than it sounds. How your seasonal selling endeavor goes depends on the product you are selling and how you have priced your listing. It is all about finding one great product according to the season. Our word of advice is that only select a seasonal product when you know how and when you are sure about selling it profitably on Amazon.